Hospitals Rethink Role of Medical Device Sales Reps During Surgery : Shots - Health News It has been an open secret that salespeople are present for surgeries at many hospitals, especially for hip and knee implants. But does the reps' expertise outweigh concerns about ethics and costs? Ochsner Baptist Medical Center in New Orleans hasn't needed device reps' help since it started using technology from a company called Sight Medical that handles inventory management. The answer to the first question is pretty easy. These sales reps typically work for medical device companies, such as Stryker, Medtronic or DePuy Synthes. Many surgeries, especially orthopedic trauma and cardiac procedures, require insertion of artificial joints or other hardware manufactured by these companies. But as to why they're present in the operating room, the answer depends on whom you ask. Critics of the practice contend that device reps attend surgeries to strengthen their relationships with particular surgeons and thereby persuade them to choose one brand of artificial hip joint or stent or pacemaker over a competitor's. 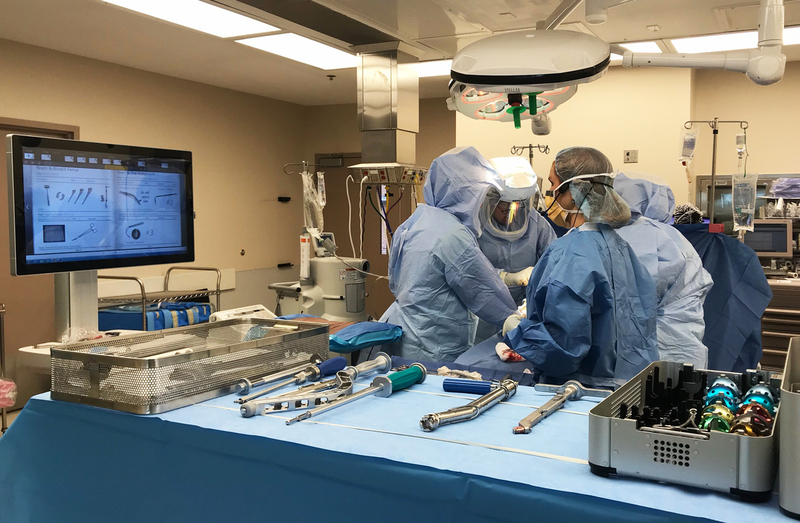 The device reps contend they observe surgeries because they are experts on particular devices and their accompanying toolkits, which often include hundreds of wrenches, screws and other hardware to aid in installation. Sometimes, the device reps have observed more surgeries with a particular device than any one surgeon. That depth of experience can be helpful, the reps say, especially with the newest device model or upgrade. "I can't keep my socks together through the dryer. You can imagine trying to get 100 pans or 300 pans of instruments all set up correctly," says orthopedic surgeon Michael Christie of Nashville, who specializes in new hips. Device reps have been attending surgeries for years, but that practice is coming under new scrutiny. As baby boomers age, there has been exponential growth in device-dependent procedures like total joint replacements. In addition, insurers are starting to crack down on health care costs, telling hospitals that they'll only pay a fixed price, known as a "bundled payment," for certain surgical procedures, such as hip or knee replacements. That approach has forced hospitals to take a hard look at the price tags of the devices and the salespeople who are pushing the latest models. Hospitals are "starting to figure out what these reps make for a living. They feel like they're making too much money, and I think that's why they want them out," says Brent Ford, a former sales rep who now works for Nashville-based HealthTrust, a firm that handles contracting and purchasing of supplies like hip implants for 1,600 U.S. hospitals. Medical device reps are more often business majors than biology buffs, but they train for the job as if they might have to conduct surgery themselves. At an educational center in Colorado, future reps learn how to saw off a hip bone and implant an artificial hip. Their corporate training frequently involves cadavers, which helps reps develop the steel stomach required for the unsettling sights and sounds of an orthopedic operating room — like a surgeon loudly hammering a spike into a bone. "Before we're allowed to sell our products to surgeons, we have to know the anatomy of the body, go through tests of why physicians use these types of products and how we can assist in surgery," says Chris Stewart, a former rep for Stryker, one of the largest device manufacturers. Stewart now works for Ortho Sales Partners, a company that helps device manufacturers navigate relationships with hospitals. Keeping those relationships strong is crucial, because hospitals don't have to allow reps into their operating rooms. But if reps are allowed, there are rules: Reps can't touch the patient or anything that's sterile. Big companies like Stryker have developed detailed policies for their own reps about how to behave in the operating room. And some hospitals, like hospital chain HCA's flagship medical center in Nashville, have instituted even stricter rules — selling is banned in the OR and reps are only allowed to provide support for surgical cases. But Stewart maintains reps still can be useful. Some help surgical assistants find a particular tiny component among the trays of ancillary tools. Some reps even deliver the tool trays to the hospital themselves, prior to the surgery. They want the procedure to run as smoothly as possible so that a busy surgeon will become a steady customer. "Obviously, there's a patient on the table being operated on, so that's where the sense of urgency is," Stewart says. "You have to become an expert in understanding how to be efficient with helping everyone in the OR making sure your implants are being utilized correctly." Stewart says it has become difficult for the hospital staff to keep pace with constant design changes for artificial joints or spinal rod systems. But the speed of innovation concerns some researchers, including Adriane Fugh-Berman, a Georgetown University medical doctor who studies the relationships between industry and physicians. "What we need are skilled helpers in the operating room who are not making money off of the choices of the surgeons," she says. Fugh-Berman has come to believe that reps should be banned from operating rooms. Her biggest concern is safety, including the occasional violations of sterile protocol. As part of her research, she anonymously interviewed reps who said they're instructed to always push the latest, most expensive products, even when the old version is more proven. "The newest device is not necessarily the best device," she says. "In fact, it may be the worst device." Yet safety issues are not what has worn out the welcome for some reps — it's their potential influence on surgical costs. Their exact effect remains hard for hospitals to quantify, but hospital executives now have a new incentive to push back on the role of the rep because insurance reimbursement formulas have changed. For example, in 2016 the government-run Medicare program began changing how it pays hospitals for a joint replacement — from a traditional billing-for-costs model to a fixed-dollar amount for each surgery. It's a cost-control move, because joint replacement has become one of the most common reasons for inpatient hospitalization for Medicare patients. Increasingly, hospitals are feeling the squeeze of these new payment caps. "They're looking at costs and saying, 'I want to understand everything that drives cost in my OR,' " says Doug Jones, a former rep with DePuy who now works for HealthTrust to control surgical spending. "I think they're becoming more aware that that rep is in there and saying, 'Is there a cost associated with it?' "
HealthTrust hasn't been telling administrators to kick out sales reps. But it has been suggesting hospitals reassess their role. The company, which is a subsidiary of for-profit hospital chain HCA, has studied particular devices, like pedicle screws, often used in spine procedures. They cost anywhere from $50 to $100 to manufacture, but a hospital might pay a thousand dollars apiece to keep them in stock. One basic spine procedure can involve several screws and rods, with the sales rep standing to make a 10 percent to 25 percent commission on the equipment used, according to HealthTrust's market research. And in many places, upselling occurs in the room, says HealthTrust's Ford. He recalls seeing reps encouraging a surgeon preparing for a procedure to use a fancier device that wasn't on the hospital's discounted list. Other HealthTrust clients are starting pilot projects on running operating rooms without company-sponsored reps and buying equipment directly from smaller firms, which often have devices that are nearly identical to the brand names. But getting rid of the rep may have hidden costs, too. Joint replacements have become so routine that an experienced surgical team can nearly operate in silence. When the surgeon says "neck" and reaches out his hand, an assistant places the piece in his hand without a moment's delay. The array of tools and components are often in the right place because a device rep made sure of it. Logistics is a big part of the job — delivering trays of instruments in the pre-dawn hours to be sterilized by the hospital, the "non-glorious side of being a rep," Ford says. The logistical role has essentially been filled by the manufacturers instead of hospitals in recent decades. And now surgeons may trust their reps more than anyone else in the room. They're often the first call he or she makes when scheduling a case, to make sure the device will be ready to go. "If that widget isn't there the next day when I'm doing a case and I need the widget, we're kind of at an impasse," says Christie, the Nashville-based joint replacement surgeon. Many experienced surgeons, like Christie, also have financial ties to manufacturers, collecting substantial royalties for helping design new implants. As of 2013, these payments are now disclosed publicly. Christie, for example, was paid $123,000 by DuPuy in 2017. An industry trade group spokesman defends the close relationship as a way to improve their products and provide hands-on training to surgeons. "Those are two areas where it's key to maintain a close, collaborative relationship, with the appropriate ethical limitations," says Terry Chang, associate general counsel for AdvaMed. The overall result is that many clinicians are happy to have reps in the room. "You say 'sales rep,' " says Marley Duff, an operating room manager at TriStar Centennial Medical Center. "I look at them more being somebody that's expertly trained in their field to provide support for the implants that they happen to sell." Duff says reps can be especially helpful when a failing artificial joint needs to be removed and replaced. Hospitals are reluctant to remove reps, for fear of irritating surgeons, who typically don't work directly for a particular hospital and could move their cases to another institution. Those hospitals experimenting with going "rep-less" have done so quietly and have had to hire additional staff to pick up the slack. One of the first in the country to try, Loma Linda University Health, boasted in 2015 of reducing costs for total knee and hip replacements by more than 50 percent by going rep-less. But a hospital spokesperson now tells NPR that the medical center has abandoned the effort, though she refused to discuss why. This story is part of a reporting partnership with NPR, WPLN and Kaiser Health News.